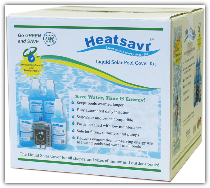 Heatsavr™ is a great alternative to a plastic swimming pool blanket, and it will fit any size or shape of pool because it is a liquid. Simply calculate the dosage to fit the square footage of your pool, and Heatsavr™ will spread itself out to cover your pool perfectly. No heavy lifting required! is still working hard to protect your heat! This pool shows Heatsavr as it spreads itself out over the surface of the water. The liquid pool cover was added to the left side of the pool, only minutes before this photo was taken. It is a self-spreading product, and you can see its progress as it moves across the surface of the pool water. The left side shows the incredible power of Heatsavr to reduce the amount of evaporation. 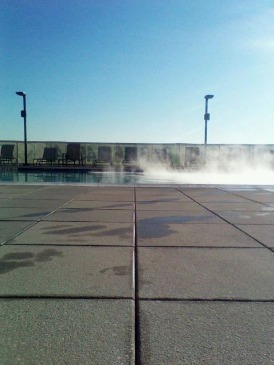 The right side of the pool, which hasn't yet been covered with Heatsavr, is losing incredible amounts of heat and water through the evaporation process, as is evidenced by the thick steam rising from the surface of the water. 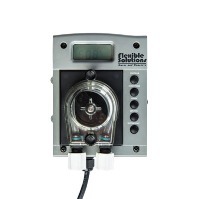 The Automatic Metering System that is a part of the Heatsavr™ Kit is a 7 day programmable peristaltic pump. When it is installed, you set it to run at the time each day, for the required amount of time to correctly dose your pool, and then you don't have to worry about it again! 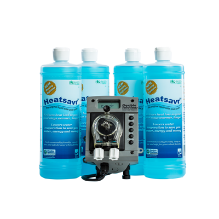 Once installed, all you have to do to ensure consistant coverage with Heatsavr™ is to make sure you replace the bottles of liquid when they are empty.